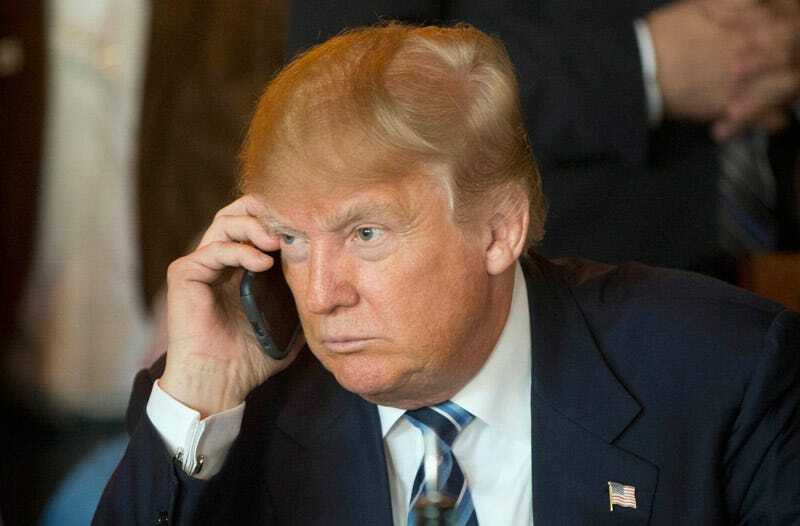 Speaking from the White House on Tuesday, Donald Trump bragged to The New York Times that he was on “the world’s most secure” telephone system, joking, “The words just explode in the air.” According to that same report, however, the President is also using what might be the world’s least secure system: the ancient, unsecured Android phone he had before taking office. Last week, the Times reported that Trump “traded in his Android phone for a secure, encrypted device approved by the Secret Service.” Previously identified as a Samsung Galaxy—likely an S3 which came out in 2012—the Android phone was widely believed to be his primary tweeting device. In defiance of all security standards, the president is reportedly still using it. This is where the story gets really weird. In an early version of Wednesday’s Times story, the newspaper reported that Trump was keeping himself company with “his new Android phone.” In an edit catalogued by change-tracking site NewsDiffs, the article was updated to read “his old, unsecured Android phone, to the protests of some of his aides.” The Times has not issued a correction. Notably, President Obama was forced to adopt a secure, “state-of-the-art” smartphone incapable of texting—much less tweeting—last year. Apparently, Obama’s smartphone was a Samsung Galaxy S4, which Ars Technica reports is the only “mobile device supported by the Defense Information Systems Agency.” In order to send his first tweet, Obama had to borrow an iPhone registered to the White House staff. But it’s important to realize that the lack of functionality is for a very good reason: security. We’ve reached out to The New York Times for more information on the change in the story about Trump’s phone habits. We’ve also asked why the newspaper didn’t issue a correction since there’s difference between Trump using a military-grade, ultra secure smartphone and an old Samsung that’s notoriously hackable. Whether the Times report is correct or not, it’s utterly unnerving that nobody seems to know if the president is using the kind of device that, previously, our nation’s enemies could only dream of.